Spray 8 mini loaf tins with nonstick oil spray. Gently wipe the spray so it leaves only a thin layer, but does not pool around the edges of the loaf tins. In a large bowl, sprinkle gelatin over cold water and allow to sit for 1-2 minutes. Add boiling water and sugar, whisk quickly until it completely dissolved, about 3 minutes. Add vodka and whisk another 1-2 minutes. Then whisk in cream. Leave the other 2 cups of the mixture un-tinted white. Pour 1 cup of prepared gelatin into each of the 8 prepared loaf tins. You should have 2 white colored tins, and 1 tin of light pink, dark pink, light blue, light purple, light green and dark yellow. Refrigerate until set up, about 60 minutes. Cut each color into its coordinating shape. 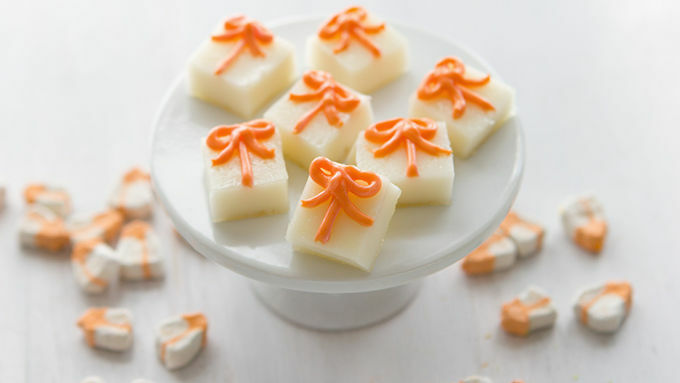 Use a sharp knife to cut one of the white batches into squares. Pipe an orange bow (like a gift) onto each square. Cut the second white batch with the teardrop-shaped cutter. 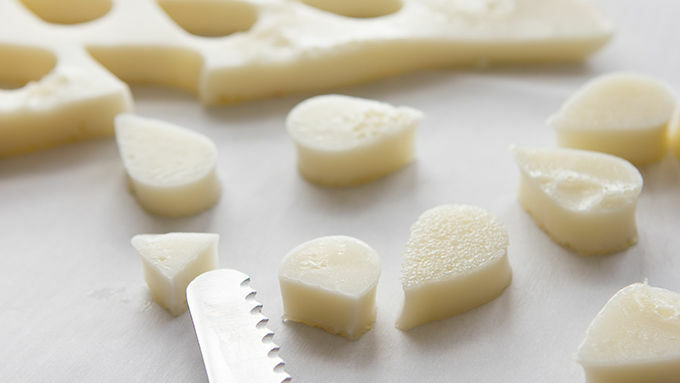 Slice the tip off of each piece with a sharp knife, leaving half-circle shaped pieces. Pipe pink, blue, and yellow frosting onto each half-circle, creating little frosting rainbows. Special equipment required: 8 mini loaf tins and mini cookie cutters in the shapes of a star, teardrop, spade, heart, moon and shamrock (sold in a set online). If you're gonna have a party, do it colorfully. And deliciously! 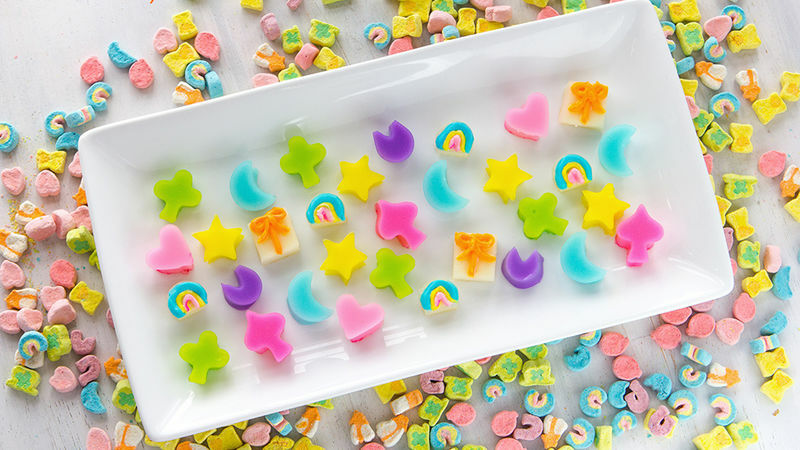 Feel like a true grown-up with boozy jelly shots shaped just like... Lucky Charms™ marshmallows! Your mom spent half your childhood telling you to not pick the marshmallows out of the cereal. But the day of reckoning has come, dear friends. You’ve grown that lumberjack beard. You make your own bed (occasionally). You’ve practically moved out of her basement. And now it’s time to eat your cereal any ol’ durned way you want—marshmallows only, vodka spiked. This recipe is adulthood, waving its bright and cheery welcome right in your mouth. Or something like that. Whatever it is, it’s brilliant. You need it. Start first with a teeny-tiny set of cookie cutters. I found these at Williams Sonoma. 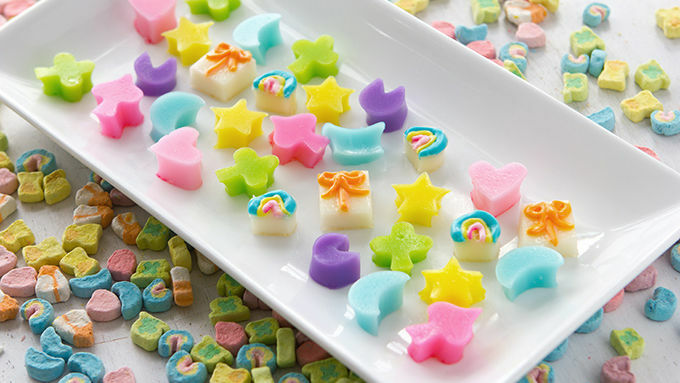 You'll need those cute little cereal marshmallows to surround your boozy versions. And then you need to find some party peeps, because you really shouldn't eat these alone... Know who you should share these with? Your mom. She’ll be so delighted to see you’re not picking the marshmallows out of the box, after all.